Arachnids are a diverse group of creatures making up most of the phylum Chelicerata, one of the four major phyla of Arthropoda. 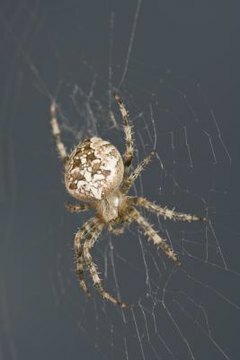 Spiders are the most commonly known arachnids, but several other types of creatures are part of the class as well. The different arachnids have some individually distinct characteristics and some features in common. The taxonomic class Arachnida contains 11 orders: Acari, Amblypygi, Araneae, Opiliones, Palpigradi, Pseudoscorpiones, Ricinulei, Schizomida, Scorpiones, Solifugae, and Uropygi or Thelyphonida. Aranaea, the order of spiders, and Acari, the order of mites and ticks, contain the most species out of the entire taxonomic class. Arachnids, whether they're spiders, scorpions, harvestmen, ticks or others, all share a few distinguishing characteristics. All arachnids have two tagma, or regions: the prosoma or cephalothorax and the opisthosoma or abdomen. Insects, by comparison, have three tagma. An arachnid's prosoma contains the head and thorax, two regions that are distinct in insects. This front region of the arachnid contains the head and limbs; the opisthosoma contains simply the abdomen and spinnerets in spiders and the abdomen and stingers in scorpions. One of the most familiar features of spiders and other arachnids is their four pairs of legs. In spiders, each leg has seven segments. Arachnids have other appendages, the chelicerae and pedipalps. The chelicerae have two parts: the large, crushing part spiders and arachnids use like jaws, and the fangs. The pedipalps resemble another pair of legs in some arachnids and antennae in others. They use their pedipalp tips to crush prey. Male spiders have enlarged, swollen pedipalps that transfer sperm to the females. Because arachnids are so diverse, their behaviors, habitat and diet vary greatly. Arachnids live in nearly every type of habitat on Earth, from deserts to rainforests and nearly everything in between. Most of the 70,000 or so named species are predators; some, particularly spiders and scorpions, are venomous. Their dietary behavior varies greatly, as well. For example, some spiders construct large webs and wait patiently for their prey to become entangled; other spiders, such as wolf spiders and jumping spiders, are particularly good hunters. Many ticks and mites (Acari) are parasitic, feeding on the blood of animals or on plant materials. Several orders in Arachnidae are sometimes mistakenly referred to as spiders. While ticks, mites, scorpions and pseudoscorpions are easily discerned from spiders, camel spiders and harvestmen are often erroneously thought to be true spiders. Camel spiders belong to the order Solifugae; harvestmen, sometimes called daddy longlegs, belong to the order Opiliones.